Paul Bloom believes that we find pleasure in the essence of things. He proposes that human beings draw meaning from the origins of things, that we are essentialists who assign value to the things around us as much from their provenance as by how they look, sound, taste, smell or function. Bloom’s ideas on art, essentialism and our sense of pleasure may explain the obsession many fanciers have with the idea of eugenically pure blooded dogs. The idea that the smallest fraction of racially impure blood in a dog’s pedigree is far worse than breeding an entire race genetically damaged (but pure blooded!) dogs has always struck me as wildly irrational. But after listening to Bloom’s ideas on essentialism I realized that most dog fanciers see the original development of a breed as a unique and specific creative act — like Michelangelo painting the ceiling of the Sistine Chapel. In their eyes any genetic addition to the original bloodline is tantamount to forgery. If Bloom is right, I may have different feelings about outcrossing because I see the creation of dog breeds simply as the result of a specific tendency and style in breeding. As an art movement rather than a specific work of art. This is an important difference because if we understand a breed as an art movement instead of a specific work of art, outcrossing is an acceptable way to refine individual art forms within the greater movement. The essentialist hypothesis may also help explain why people are so intensely opinionated about breeding dogs because, according to Bloom, when we experience a thing in what we feel to be its essence, we find a deep sense of pleasure in it. And – when we believe that we have been fooled into experiencing a thing as being genuine when it is not, we feel a deep sense of revulsion. So while I see an LUA Dalmatian as a logical bit of experimentation within an art movement, those who see dog breeds as art forms are likely to view it as an abomination. My friend Rob pointed out the odd resemblance between these two portraits to me today. While it might seem strange to link Martin Luther to a dog, Luther had a dog named Tolpel and though the word loosely translates as fool or lunkhead after reading dog-related quotes ascribed to the man, I get a strong sense that he was quite fond of the animal. And in an odd bit of coincidence, the best known of these refers to a dog’s rapt attentiveness. When Luther’s puppy Tölpel happened to be at the table, looked for a morsel from his master, and watched with open mouth and motionless eyes, he said, “Oh, if I could only pray the way this dog watches the meat! All his thoughts are concentrated on the piece of meat. Otherwise he has no thought, wish, or hope. I may be a lapsed Lutheran but I agree whole-heartedly. The kind of intense, rapt attention a dog is capable of focusing on meat (or in this photo, his master) is something to aspire to. William Graffam wrote a book for children about Tolpel’s observations on Luther which appears to be quite hard to find. I’d love to find a copy because LibraryThing lists it under the tags ‘Lutheranism’ and ‘comics’. As I finish this post I realize that the many generations of Lutheran church basement ladies I am descended from would very heartily disapprove of the comparison I’m making. The desire to avoid unpleasant things is incredibly strong. Nobody likes being dirty, diseased, distressed or disappointed. We dislike these sensations so much that we’ll go to great lengths to avoid them. While avoiding unpleasant things is adaptive in a lot of situations (that’s obviously why we evolved to seek the release of it), there are times and places where is does more harm good. The thing is, avoidance often only offers a temporary solution. No matter how terrified you are of the dentist’s chair, you can only put sitting in one off for so long. Sooner or later (barring an early death) a problem will arise that is so painful and/or debilitating that the discomfort it causes will over-ride your fear. And instead of a simple check up and cleaning you’ll end up having your fear reinforced. Avoidance doesn’t just feed our anxiety and drive us to procrastination, there is also a large body of data demonstrating that the things we learn through escape and avoidance are extremely resistant to extinction. Because escape and avoidance evolved to help us survive in situations like those shown in the video below, lessons acquired through these drives can be extremely difficult to unlearn. To avoid falling into the trap of maladaptive avoidance behavior you need to realize that unless you are in a near miss situation where immediate action is required to escape disaster, you should use your higher mental processes to assess a situation before chasing after the immediate gratification offered by simple avoidance. The trap of avoidance is easy to all into and, unfortunately, avoidance reactions can inadvertently set off complex chain reactions that lead to unexpected problems. This happens in a broad range of situations as illustrated in a couple of recent news items. …Allison Aiello, a professor at the University of Michigan, recently surveyed all of the experimental or quasi-experimental studies published in English between 1980 and 2006 on the effectiveness of different hand washing strategies . Aiello focused on studies that compared different strategies, for example the use of normal soap versus the use of antibiotic soap, in terms of their effect on the probability of developing gastrointestinal or respiratory illness. Our intuition is that antibiotic soaps and wipes should make everyone healthier. Aiello’s results were something else entirely. Aiello’s first result was fine enough, but it set the stage for the trouble to come. She found “the use of nonantibacterial soap with hand hygiene education interventions is efficacious for preventing both gastrointestinal and respiratory illnesses.” In other words, if you wash your hands with soap (and are educated about washing your hands with soap) you are less likely to get sick. Score one for intuition and grandma’s admonitions. But then things went terribly wrong. Dunn cites studies that indicate that chronically ill people who used antibiotic soaps actually suffered from an increased susceptibility to coughs, colds and infections when compared to those who used regular soaps. He also discusses how, triclosan, the active ingredient in most of these products, is spreading it through the environment where it appears to be creating an ugly chain of unintended consequences. In an interesting parallel, Lori Gottlieb’s How to Land Your Kid in Therapy, published in the July/August edition of The Atlantic illustrates how our desire to help those we care about avoid unpleasant feelings can actually turn them into chronically unhappy and unfulfilled people (bold emphasis is mine). Paul Bohn, a psychiatrist at UCLA … believes many parents will do anything to avoid having their kids experience even mild discomfort, anxiety, or disappointment—“anything less than pleasant,” as he puts it—with the result that when, as adults, they experience the normal frustrations of life, they think something must be terribly wrong. But — putting efforts into helping your child or your dog avoid discomfort in the short term is a lot easier than making and implementing a plan to teach them how to avoid and cope with it on their own in the long term. While avoidance motivation can help us figure out that a problem needs to be solved, outside of near miss situations, avoidance-based decision making is only adaptive when we use it to choose a specific goal and a course of action to achieve it. And that’s not easy to do. Our avoidance drives aren’t specific. When you’re in avoidance mode you’re only focused on feeling good (or at least less bad) in the moment and all other goals are pushed aside. If you’re a gazelle living living on the African savanna, avoidance reactions keep you alive. A gazelle’s only long term goals are to survive and reproduce, and avoidance reactions suit this kind of life well. A human with a job and a mortgage lives in a far more complex world and has a very different set of goals. We need to be able to select and maintain our focus on goals that can require years or even decades of effort to achieve. And that’s hard to do, because every day avoidance sets enticing little traps to divert us. 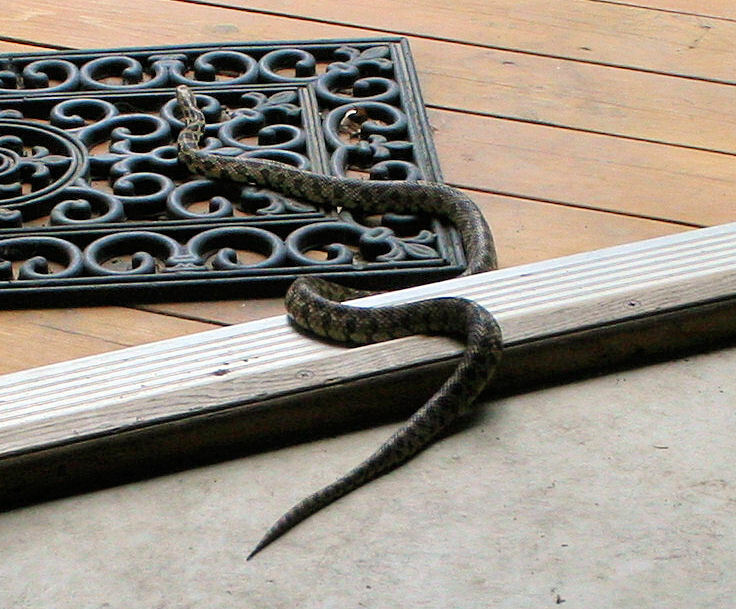 I snapped a picture of this large fox snake a few minutes after I stepped over him on my way into the garage. Even though (or maybe largely because) I’ve spent much of my life working outdoors in areas where poisonous snakes were fairly common, I like snakes. And the wooded bluffs of our property are ideal fox snake habitat (they’re also ideal habitat for ratsnakes and the rare massasauga rattler). So my reaction to unexpectedly stepping over a largish snake was to reach for a camera, not a shovel. The fox snake is one of Minnesota’s largest snakes. They eat small animals, birds, eggs, frogs, and lizards. Fox snakes belong to the rat snake group and kill their prey by constriction. When fox snakes are harassed, they vibrate their tails and strike. Because of this and their superficial resemblance to rattlesnakes, they’re commonly killed by humans who don’t realize their importance in controlling rodent populations. The largest fox snake on record was observed in the county where we live. Because this snake is big enough to eat the chicks that should hatch out here in about a week, if I keep seeing him around I’ll catch him and relocate him to a chicken free coulee in the area. Yesterday was Meet Your Meat day. Chucky, Mark and I visited the farm where most of the meat we’ll eat next year is being raised. When your food is raised by close friends on a small farm, socializing with the creatures that will go into your freezer is considered proper etiquette. The chickens were only vaguely interesting to the boys. Chuck runs loose with our little flock every day and after two years of living with chickens in his back yard my husband takes them for granted now too. 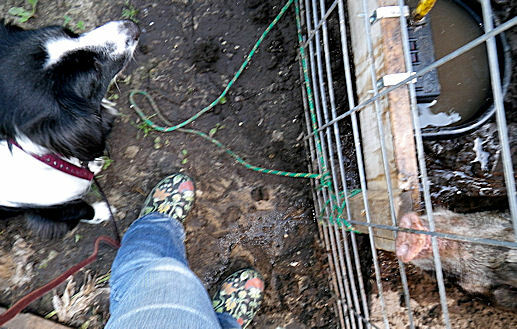 Chuck did get a small chance to show off his chicken herding skills because it was time to move the tractor the rangers were in and considering the fact that these chickens had never seen a dog before, he did a pretty good job. The pigs were a much more interesting experience. Chuck’s initial reaction to them was a very practical and deliberate cautiousness. The boy’s come a long way from the dog who went bug-eyed and pancaked himself into the ground every time he encountered something new. Because these Berkshire hogs are omnivores who are at least eight times his size, I thought that his reaction to them demonstrated an excellent degree of common sense. Chuck at left, is sitting quietly and politely avoiding direct eye contact. The pig, on the other hand, was whoring for attention. (Pet me! Brush me! Feed me! MAKE MORE MUD FOR ME TO WALLOW IN!) And really, since there is a one in three chance that I will eat this specific pig, I kinda felt obliged to give it up for him. After pigs and chickens we went on to meet the steers. Chip and Dale are British White cattle, a beautiful, docile, ancient breed that fattens up well on pasture. The boys stood calmly and politely as we walked up to greet them. I kept Chuck on a leash at first, he’d never met any cattle and I wasn’t sure how the steers would react. As you can see, the first meeting went well. And so did the second. Still on leash, but with his handler at a distance. Note the relaxed, happy smile. It wasn’t long ’till we progressed to dropping the leash and letting everybody hang out together. From the cow pasture we moved on to the creek. Chuck’s never been swimming. 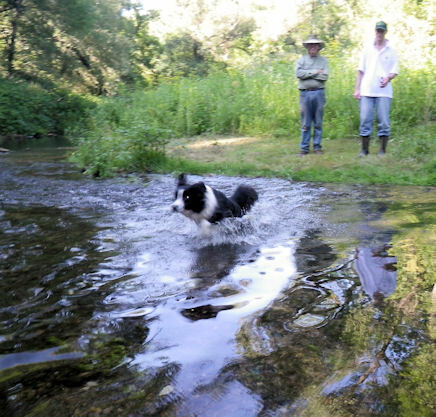 He loves playing in a spray of water and he’s been very good about baths, but between his orthopedic problems and mine, I haven’t had a chance to take the boy to a swimming hole. Deep water can be intimidating to a dog, but as it turned it, Chuck didn’t need much encouragement to go in. I walked across the creek and called him. After a bit of hesitation the boy launched himself across. And once he figured out that it was wonderfully wet and it wasn’t going to kill him — the boy absolutely adored being in the water. Chuck’s first foray into the creek. Note the panicked leap and wild eyes. 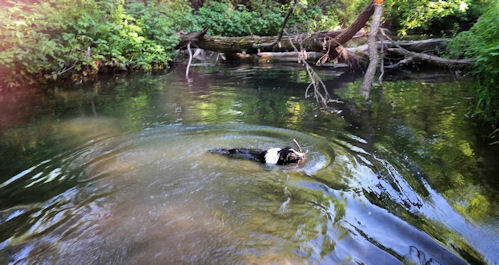 Shortly after, a relaxed, happy boy calmly and repeatedly swims out to fetch sticks. And then just swims around on his own for the hell of it. He had an excellent day off.